Bending protocol, Mr. Kushner arranged for Prince Mohammed, often referred to by his initials as M.B.S., to receive the kind of treatment usually reserved for heads of state, with photographs and news media coverage, according a person involved in the arrangements. It appears to have been the first face-to-face meeting between Mr. Kushner and the prince, but Mr. Kushner raised eyebrows by telling others in the White House that he and Prince Mohammed had already spoken several times before, two people at the event recalled. The Saudi team included Musaad al-Aiban, a cabinet minister involved in economic planning and national security, and Khaled al-Falih, installed by the prince as minister of energy and chairman of the state oil company, according to executives who met with them and a person who was briefed on the meetings. Mr. Aiban did not respond to a request for comment and Mr. Falih could not be reached for comment. 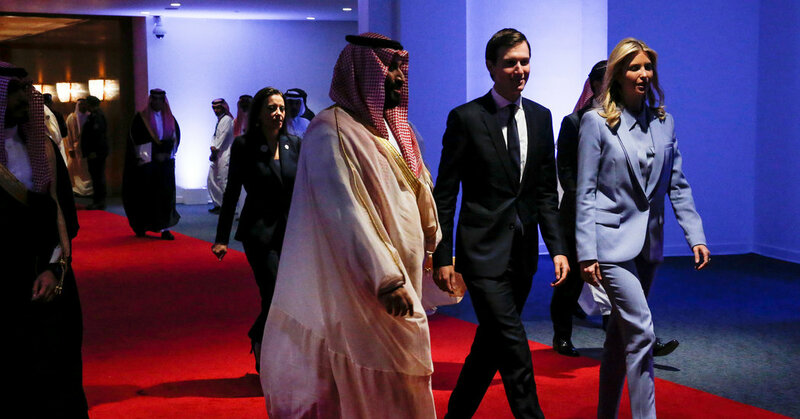 The White House visit was also the first of several face-to-face encounters with Mr. Kushner that preceded key turning points in Prince Mohammed’s consolidation of power. A month later, in April, Prince Mohammed orchestrated the ouster of his older cousin, Prince Mohammed bin Nayef, removing him from control of the Saudi Interior Ministry and replacing him as crown prince. Shortly after Mr. Kushner visited Riyadh with the president in May, Prince Mohammed announced a Saudi-led blockade of its neighbor and rival Qatar, the host of a major American air base. And days after Mr. Kushner made an unannounced visit to Riyadh in the fall of 2017, the crown prince summarily detained about 200 wealthy Saudis, including several of his royal cousins, in a Ritz-Carlton hotel in Riyadh. White House officials also say that Mr. Kushner has formal conversations with many other leaders in the region.